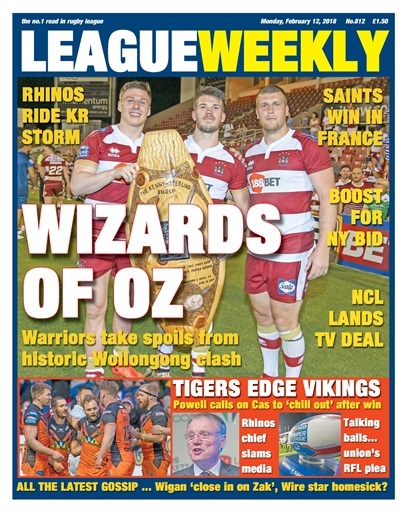 Wigan are the WIZARDS OF OZ as Super League makes an impression on Wollongong. 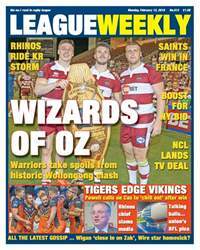 We have all the action from Down Under covered, plus expert analysis of Super League's historic clash – and reports and reaction from the rest of the top flight action as Castleford edge out Widnes for their first win of the season. We're talking balls... specifically Rhino balls... as players union chiefs call for the RFL to take action. Meanwhile, in the second part of Mascord Meets, Gary Hetherington has stern words for the rugby league media who he accuses of spreading misinformation about the ongoing structure review. Unsurprisingly, no nonsense publisher Danny Lockwood has a bone to pick with the Rhinos boss as a result! New York chiefs are given a boost to their bid to take Super League to New York. Meanwhile, Dave 'Nosey' Parker brings all the latest RL goss, including more on Zak Hardaker's supposed switch to Wigan and questions over whether Warrington's star man is homesick already! Salford star Mark Flanagan is put in the spotlight.